Joaquín Torres-García: The Arcadian Modern | The Bottom Line "The Drawing Center"
Joaquín Torres García (Uruguayan, 1874–1949). Composition. 1931. Oil on canvas. 36 1/8 x 24″ (91.7 x 61 cm). The Museum of Modern Art, New York. Gift of Larry Aldrich, 1956. © Sucesión Joaquín Torres-García, Montevideo 2015. Photo Thomas Griesel. 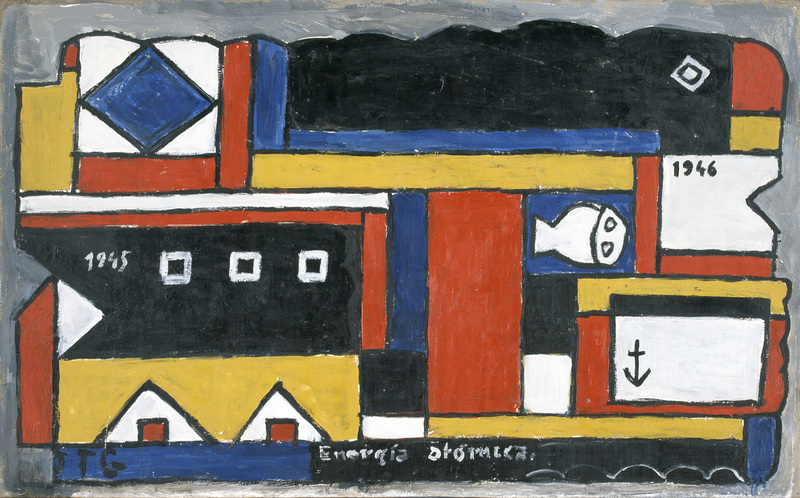 On view through February 15th, The Museum of Modern Art is presenting a retrospective of the Uruguayan artist Joaquín Torres-García. Curated by Luis Pérez-Oramas, Joaquín Torres-García: The Arcadian Modern features the artist’s works that range in date from the late-nineteenth-century to the 1940s, including drawings, portraits, sketches, and sculptures, to name a few. 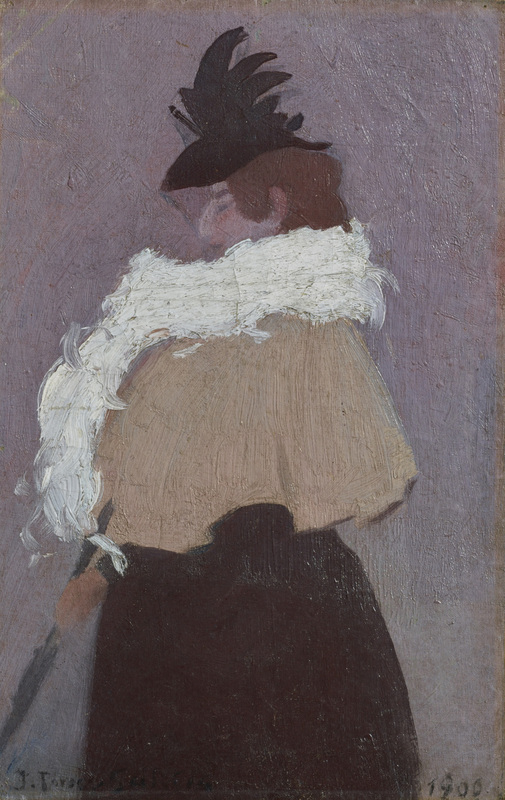 The exhibition demonstrates Torres-García’s development as he moved from a traditional approach in the frescoes and portraits of his early years to the articulation of a unique abstract style in his later years. Joaquín Torres-García (Uruguayan. 1874–1949). Lo temporal no és més que símbol (The temporal is no more than symbol). 1916. Fresco transferred to canvas mounted on strainer, 226 3/8 × 130 5/16″ (575 × 331 cm). Generalitat de Catalunya Fons d’Art. © Sucesión Joaquín Torres-García, Montevideo 2015. Photo credit: Ramon Maroto. Centre de Restauració de Béns Mobles de Catalunya, CRBMC. Generalitat de Catalunya. The exhibition starts off with Torres-García’s designs for frescoes in the Paulau de Generalitat, the seat of the Catalan government in Barcelona. 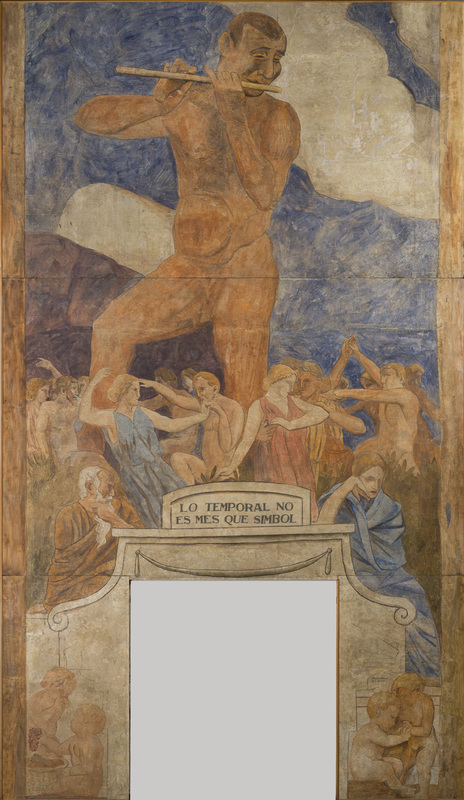 The finished fresco titled Lo temporal no es mes que simbol [Time is Nothing But Symbol] is surrounded by preliminary drawings of the design as well as portraits where he focuses on the form of his subjects, such as a self-portrait and Figura de mujer [Figure of a woman] (1900). Joaquín Torres-García (Uruguayan. 1874–1949). Figura de mujer (Figure of a woman). 1900. Oil on board, 18 1/2 x 11 13/16″ (47 x 30 cm). Private collection. Switzerland. © Sucesión Joaquín Torres-García, Montevideo 2015. Photo credit: Peter Schälchli, Zurich. The next section showcases Torres-García’s experimental works. After relocating to New York in 1920, he became interested in the chaos of the city life, especially photomontages used in advertising as well as modes of transportation, including planes, cars, and trains. 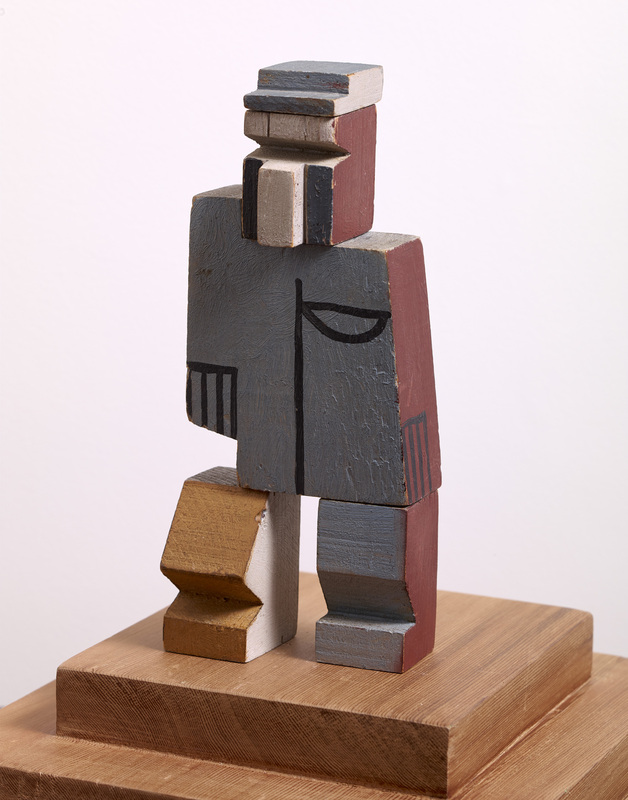 During his time in New York, Torres-García worked as a toymaker, where he found similarities between sculptures and paintings. His interest in volumetric space, perspective, and vantage point manifested itself by exploring three-dimensional form from wooden blocks and creating tiny wooden sculptures. He played with the articulation of the blocks, treating each flat surface like a painting. While embracing facets of European modernism such as abstraction during the 1920s, Torres-García began to turn away from the representation of human figures as European and create portraits that drew from pre-Hispanic sources. Joaquín Torres-García (Uruguayan. 1874–1949). Hombre (Man). 1930. Painted woods (5 pieces), 8 1/16 x 3 1/8 x 1 1/4″ (20.5 x 8 x 3.2 cm). Guillermo de Osma, Madrid. © Sucesión Joaquín Torres-García, Montevideo 2015. Photo credit: Joaquín Cortés Noriega. This period of experimentation in the 1920s paved the way for Torres-García’s use of line as both a method for separation, delineating areas of the work, as well as inclusion, lending cohesion to the overall painting. He created grid systems within his paintings that play with volume, perception, and space. Although the works are flat, Torres-García’s grids elevate certain elements of the painting while subverting others, distinguishing between planes within the grid. Joaquín Torres-García (Uruguayan. 1874–1949). Energía atómica (Atomic energy). 1946. Oil on cardboard. 20 7/8 x 33 3/8″ (53 x 84.7 cm). Colección Guillermo Caballero de Luján, Valencia. © Sucesión Joaquín Torres-García, Montevideo 2015. Photo credit: Juan García Rossell. The exhibition ends with Torres-García’s later works in which he turned to using primary colors, but continued to use grids and schematic figures. 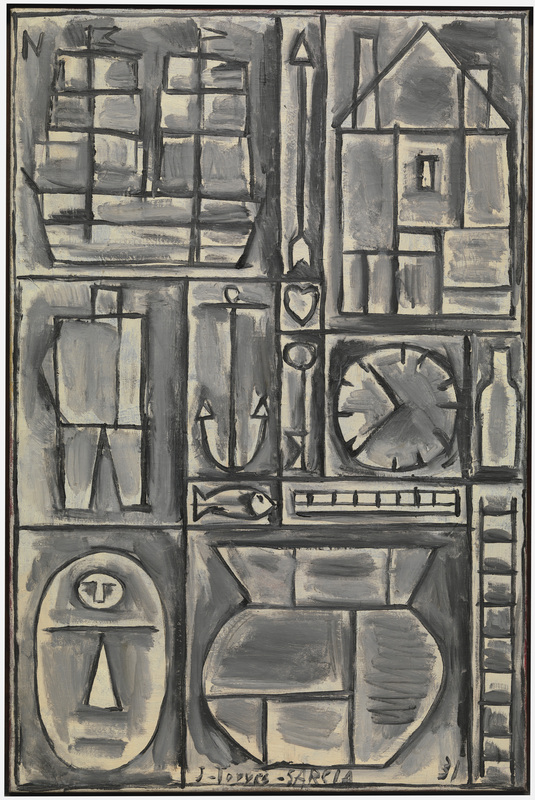 The retrospective comes full circle as the motifs found in his earlier works, such as Arcadian maternity scenes, are depicted in a more abstract and schematic manner, including Torres-García’s last painting, entitled Figuras con palomas [Figures with Pigeons] (1949).